This article is considered accurate for the current version (2.2) of the game. This article is for the PC version of Stellaris only. 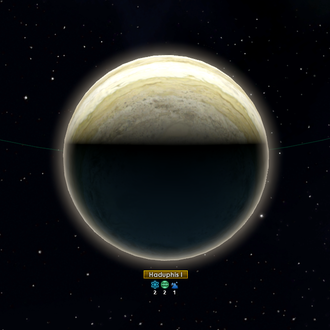 A gas giant with four units of research resources and one unit of the very rare Zro aerosol. In Stellaris, the economy is based on the production and consumption of resources and services either from a specific planet or throughout the empire. It relies on heavily on Pops working on different Jobs, or mining stations built over various celestial bodies. Resources can vary from fairly common food crops to very rare substances such as dark matter and from physical minerals to "produced" knowledge, such as engineering research. In that way, resources are very important and ought to be quickly scouted, exploited, and developed. There are three kinds of resources: Material, Abstract and Strategic. All material resources and strategic resources (except Trade Value) must be stocked. All empires have a 15000 basic stock capacity for each kind of them, and can build Resource Silos building on planet and starbase to expand it. Any produced resources that cannot be stocked will be wasted. Material resources are the most important type as they provide the means to expand both geographically, developmentally and technologically. They are gathered and stockpiled on a monthly basis, but not necessarily on the same day. While they all have a stockpile, how that stockpile and the excess is used varies fundamentally between each resource. Energy credits is an energy backed currency accepted by all space-faring races, and acts as the market's currency and "food" for robotic pops. Other than trade, they are mainly used for recurring expenses such as maintenance of buildings, ships, spaceport modules, stations and food replacement for Robots. Energy credits are also expended as lump-sum payments for other various tasks, such as recruiting leaders, clearing tile blockers, initiating terraforming (a significant investment, with the cheapest process costing 2000 energy), and building robots. Finally, they can also act as a bargaining chip in trade deals with other empires. They can be acquired by building mining stations around celestial bodies with energy deposits, sell other resources or slaves in internal or galactic market, building solar panel modules in a starbase and by constructing generator districts on colonized worlds. Non-Gestalt Consciousness empires can utilize Trade Value to produce extra energy credits. Unlike other resources, an empire can stockpile up to 50000 energy credits by default. Minerals is a collective term for the basic resources an empire needs to construct stations and planetary buildings. They're also consumed by various jobs as materials. They, like energy credits, can be obtained by building mining stations around celestial bodies with mineral deposits, or building Mining districts and Mineral Purification buildings on habitable planets. It is also possible to obtain Minerals by building Nebula Refineries on Starbases, as long as the Starbase is located within a Nebula. Nebula Refineries produce +6 Minerals and there can only be one such building on each Starbase. Each Mining District produces 2 Miner Jobs while each Mineral Purification building produces 1 Miner Job. Every Miner job produces +4 Minerals by default but the yield can be increased by building Mineral Purification buildings on the planet. A Mineral Purification building will increased the Resource Output of Miner jobs on the planet by +15% or +25%, depending on level. The Mineral yield can also be increased via the Mining Guilds Civic, which will increase the amount of Minerals produced by Miner Jobs by +1 Minerals. The primary purpose of Minerals is to function as the raw material for Space and Planetary Construction. Significant lump sum expenses are applied to these projects upon queuing them up, which will then take some time to complete. Here it acts as the primary limiter on expansion and planet development. Minerals are arguably one of the most vital resources in the game as they used to manufacture many advanced resources, like Consumer Goods and Alloys. Consumer Goods are needed for things such like upholding Living Standards and producing Amenities (which are both vital for ensuring internal stability and economic output) as well as for Research. Alloys on the other hand are needed for all Space-based construction, including but not limited to; Ships, Starbases Mining Stations and the like. Minerals can also act as a bargaining chip in trade deals with other empires and can be bought from other empires if needed. It is often important to have a sizable storage and output, in order to better deal with urgent situations and be able to survive production sites being lost or cut off. Minerals production should be pretty much maximized at all times, unless there is an energy shortage or the empire has passed the point of saturation and cannot put minerals to use faster. Food represents the various nutrients requires to sustain and grow organic pops. Empire food rationing and distribution can be managed via the empire policies, evaluating food spending against pop growth and happiness. Each planet grows its own food which is then added to an empire-wide stockpile that feeds the whole empire, with every planet exporting and importing food according to production and consumption. Surplus food does not increase population growth directly, but 1000 food can be spent on a planetary decision to boost local population growth by 25%. An empire-wide food shortage leads to starvation, which decreases happiness by 25% and pop growth by 75%, although existing pops will not die. Food is only used by organic pops; machine pops use Energy Credits as a replacement. Food can be produced by constructing orbital hydroponic farms on starbases or by creating farming jobs via building Agricultural districts, Hydroponic Farms and Food processors on the surface of a planet. Each Hydroponics Bay building on a starbase produces 3 food while each farmer job in an agricultural district, hydroponic farm or food processing building produces 6 food. The yield can be increased by building food processors; these buildings provide farmer jobs and will also increase the food output of all farmer jobs on the planet by either 15% or 25%, depending on level. Food output is also affected by productivity modifiers such like stability, technology (both regular and repeatable). Every Agricultural district generates 2 farmer jobs (3 for Hive Mind) while every Food processor building generates 1–2 farmer jobs, depending on level. Each starbase can only support one Hydroponics Bay building. Every planet can support a certain amount of agricultural districts, with the amount varying depending on the size of the planet and any planetary features. If one wants to increase a planet's food production beyond that, the empire can do so by building Hydroponics farms, with each one taking up a building slot and provide 2 farmer jobs, making the amount limited by building slots. As for Food Processor buildings; every planet can only support one such building. An empire can also obtain food by extracting it from pops, which is done by either enslaving the species and setting the slavery policy to "Livestock" or by purging the species and setting the purge policy to "Forced Labor" or "Processing". Livestock yields 4 food per pop every month, although the pops in question will still consume 1 food per month, while Forced Labor and Processing purges yield 3 and 6 food per pop every month without any upkeep until the pops are killed. In the case of Livestock and Processing, the yield can be increased by Gene-modding the targeted species to have the Delicious trait as it increases the food obtained from each pop by +2. Food is one of the cheapest market resources, rated at 1 Energy per unit without fees. Alloys are advanced resources with a military application, which we need to construct Ships and Starbases. Consumer Goods is an advanced resource that represents various gadgets, luxuries and goods necessary to give your Pops a good life and perform intellectual Jobs such as Research. Trade Value represents civilian day-to-day economic activity. Starbases collect Trade Value and convert it into resources such as Energy Credits if connected to your capital planet through a Trade Route. Trade Value that is directly collected by your capital Starbase does not need a trade route to generate resources. Abstract Resources represent non-physical assets that an empire has access to. Strategic resources are rare resources required to both build and maintain advanced buildings and ship components. They are valued far more than the common basic resources. Natural strategic resource deposits are always visible but requires specific technology to exploit. Rare and exotic gases with a variety of uses, particularly in the operation of advanced energy-based weaponry and force fields. Some of the gases can also be used as starship fuel or even as recreational drugs. These crystals have properties that make them extremely effective at focusing laser beams, and they are also a critical component in most advanced electronics. In addition, many cultures treasure them as decorations and adornments. An extremely rare aerosol of exotic particles. It has been deposited on a number of worlds through meteor impacts, but its true origin is a mystery. If ingested by psionically-gifted individuals, zro acts as a very potent (and addictive) drug that enhances PSI abilities. This exotic substance has many properties that seemingly defy several natural laws. Harvestable concentrations can only be found near Black Holes or in certain nebulas. This inorganic metal shows characteristics usually seen only in biological life forms. It will always attempt to regenerate back into the shape it was stabilized into. Simple but powerful nanoacutators, allowing for complex manipulations and experiments of macroscopic scales. This page was last edited on 18 April 2019, at 23:14. Content is available under Attribution-ShareAlike 3.0 unless otherwise noted.